Maya at Christmas 2007. Shh don't tell her it's really a cat costume. She's already suspicious. After the diagnosis in 2008 we remained cautiously optimistic about Maya’s health. We started consulting with Dr Woodfield, our local cardiologist to have her monitored every 12 months. 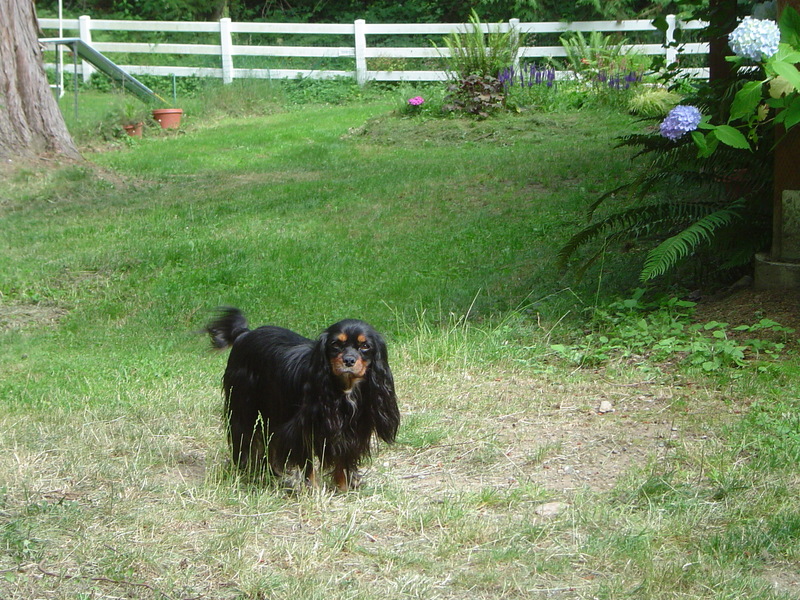 Statistically she was somewhere in the middle – we knew that 50% of Cavaliers develop Mitral Valve by age 5. 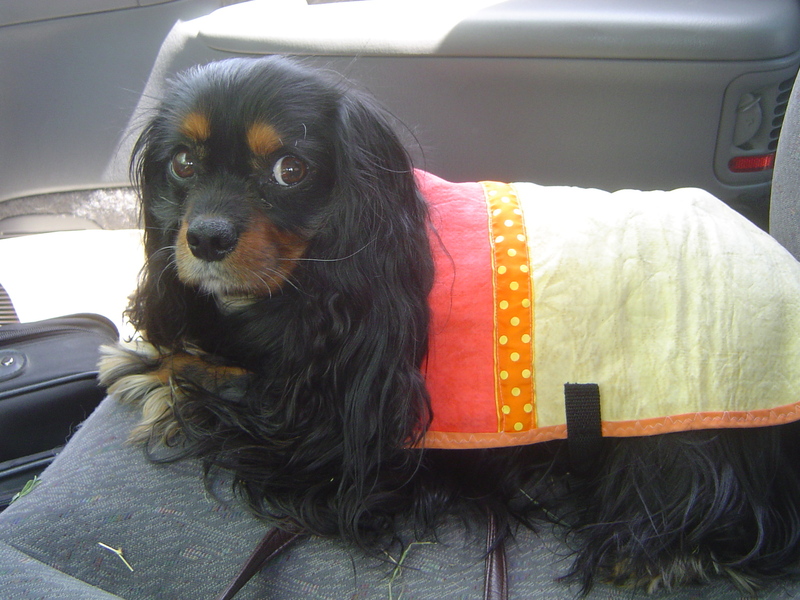 Her prognosis wasn’t as bad as a very young Cavalier with Mitral Valve disease but it would play more of a factor in her health than Cavaliers who developed it later in life. She continued to eat, sleep, run, and enjoy life without any additional medication. I was busy with additional dogs in the house so the subtle signs of heart problems crept in slowly, e.g., she started to get uncomfortable sitting on laps. 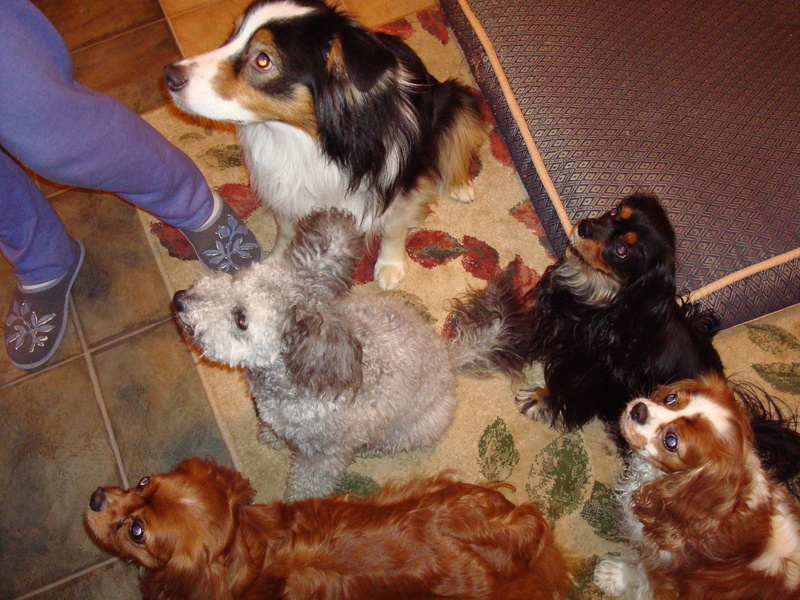 Maya eagerly awaiting Bella's first birthday cake along with the other puppies. 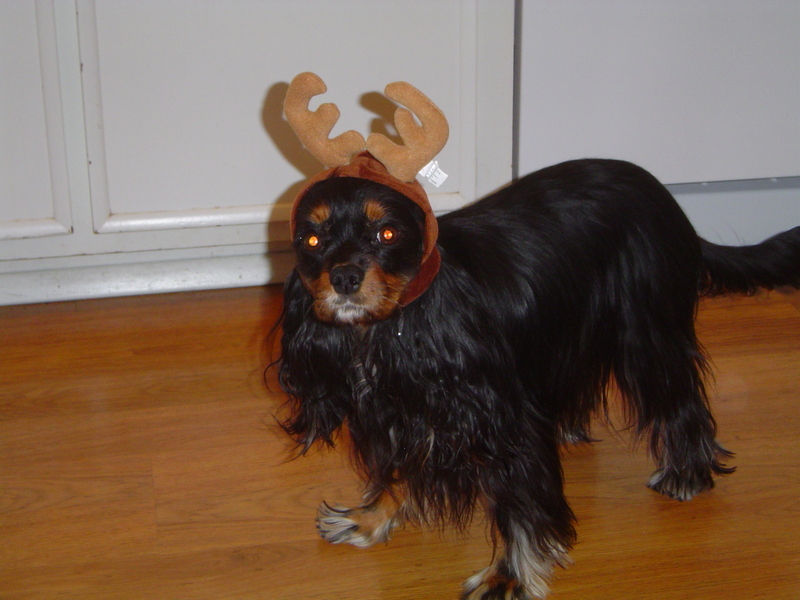 Also, during this time we brought our own Cavalier puppies into the world. Beth and Denzil, another great agility Cavalier, produced 3 lovely ruby girls, a black and tan boy and and black and tan girl. 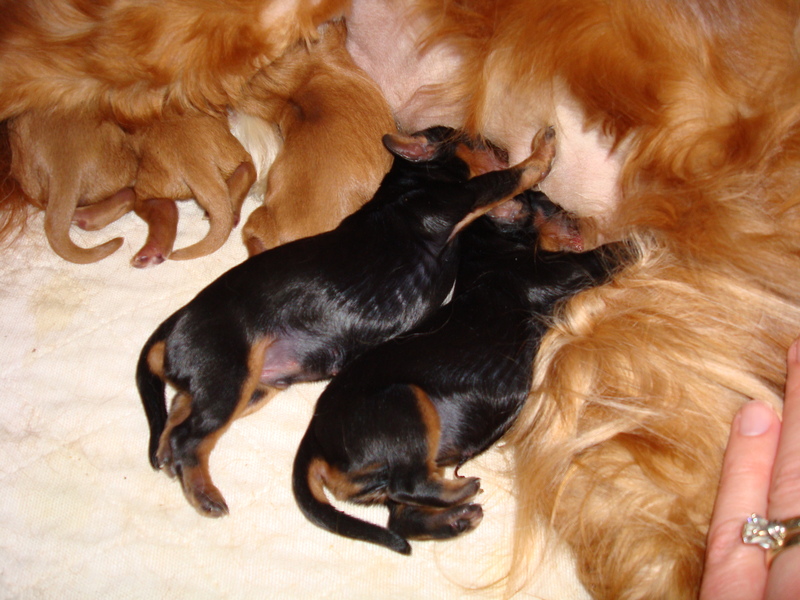 Again I had hoped to keep only a black and tan boy for breeding and showing but when my surprise black and tan girl showed up last of the litter I just knew she wasn’t going anywhere. And it’s no surprise that she’s sitting on my lap now 3 years later as I type. 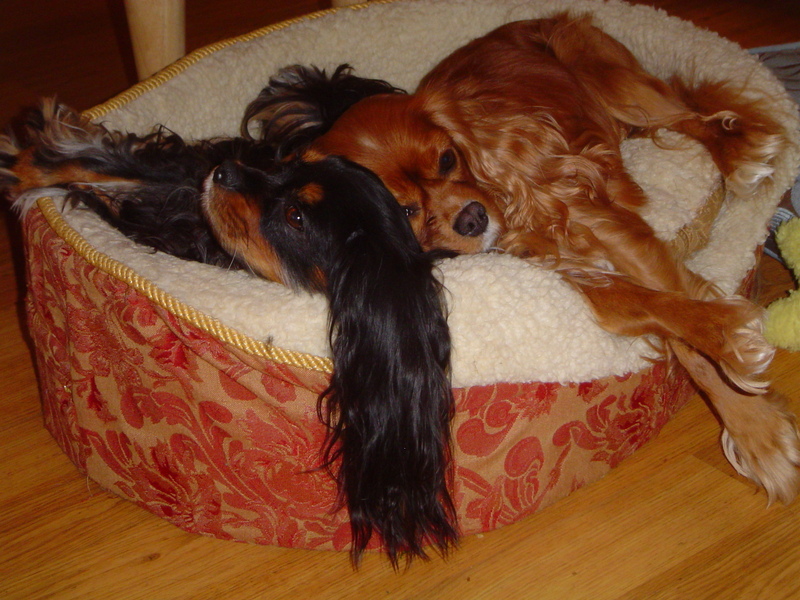 Minnie and Granger our younger generation of Cavaliers shortly after birth. Maya continued to compete in agility and again got invited to the AKC Agility Invitational in California at the end of 2008. With other dogs in the house now competing in agility, knowing that her fastest years were behind us, and that we’d soon have 2 new human daughters in our house I prepared for this to be our last big competition. Maya did great and still ran the fastest times out of all the Cavaliers there, but a missed contact kept us out of the finals. One of the highlights for me was meeting the father of our puppies Denzil in the flesh, as the breeding was done through AI. Over the years Maya’s coat got quite thin with the long term Prednisone treatment but she always had a long straight coat with long, long ears that looked magnificent. Another picture from what I call the "really long ear period." Some people claimed the long ears gave her an unfair advantage in agility. During the first part of 2009 our lives very much revolved around our daughters who arrived home with us from Ethiopia in February 2009. I concentrated what little time I had on training my new black and tan girl Minnie and my Pumi Bella. With 6 MACH titles under her belt Maya didn’t have to prove anything more about her agility skills. However, she really still enjoyed getting out and running agility, barking madly at the start line the same as she ever did, so I thought let’s finish out our MACH 7, which we did at the Evergreen Golden Retriever trial on August 30 2009. By summer 2009 Maya’s heart disease was being classified as moderate and the murmur was about grade 3. She was on Enalapril now as well as Prednisone and after MACH 7 I prepared to hang up the agility leash forever. But Maya seemed bored and depressed without anything to do so we gradually brought her back into agility competition at a lower height.